Maximize the Health Benefits of Grass-Fed Beef: Know Your Meat. Depending on the source, a grass-fed steak cooked perfectly can be a delicious culinary experience – or not. Why? It comes down to management. When animals graze in lush pastures, are moved often to new ground, and plants are allowed to recover, both the animals and the land benefit. When animals are parked in the same ‘pasture’ all summer long, the plants and soil suffer and the final product will probably be overly lean and tough. Since the term ‘grass-fed’ is not regulated, it can be used for a variety of management systems. Grass-finished is a term that is used to mean the animals exclusively ate grass throughout their life, without grain supplementation. However, it doesn’t tell you anything about pasture quality. How to know if you are getting the good stuff? A basic understanding of common production practices can give you an idea of what to look for or what questions to ask. A grass-fed system is designed to mimic natural herbivorous herds such as bison, who grazed over large expanses of grasslands, moving frequently to avoid predators. In modern day grass-fed production, we use temporary fences to move cows multiple times per day to avoid overgrazing damage. We see our pastures as a giant solar panel, capturing solar energy to grow high quality grass and clover, keeping the soil covered, sequestering carbon and building soil health, while also turning this solar energy into high quality protein in the form of meat. Grass-fed beef graze on a diverse ‘salad’ of grasses, clovers, and broad-leaved plants, which provide energy (sugar), protein, and minerals. Cows should be actively grazing on plants at least 8 inches tall. You don’t want to see cows standing around on what looks like a putting green. Or worse yet, cows in a dirt lot eating hay in the middle of June. Hay is for the non-grazing season when the ‘free’ grass is no longer growing. How often are the animals moved? It depends, but in a management-intensive system, cows may be moved every 8-12 hours. The pasture area (paddock) is then sized for what the herd’s feed intake demand is for that period of time. Occupancy periods should be short to prevent overgrazing damage. To think more about occupancy, think of an all-you-can eat buffet. At first you have great selections, however imagine what it would be like after 3 days if no one changed it? Then imagine if you walked all over it. We want the cows to move in to a paddock, eat the best and move on. When cows leave an area, the plants left behind should not be shorter than 3-4 inches. Plants then need time to recover before being grazed again. In the spring, this period can be 2-3 weeks, depending on precipitation. By late summer, the recovery periods may increase to 45 days or more. A cow can physiologically take only so many bites per day. As managers, we want each bite to be a full mouthful, so she fills up her rumen (stomach) quickly. Ideally, a cow will spend 8 hours eating, 8 hours ruminating (chewing cud) and 8 hours sleeping. The more the cows chew their cud and sleep the better for weight gain. We don’t want them to spend all their time trying to find something to eat. A cow who walks all day will be lean and tough. 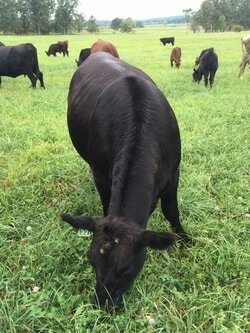 With proper management, animals can gain and reach ‘finish’ weight on high quality grasses and other pasture plants. Grass-fed beef can be tender and marbled, while also providing the advantage of Omega-3s and CLAs that a grass-based diet provides. Learn more about the benefits for the animals, farmers, land and consumers.